HP TouchPad, coming to a Woot.com near you? Let’s just put it out there. How is HP’s TouchPad going to rise above the rest in this maelstrom tablet market? If you look at the different strategies available to HP, the choices are few. They could take a page out of RIM’s Playbook and tightly couple the TouchPad to WebOS phones, but this limits their appeal to loyal Palm customers, an unfortunately shrinking population. The other potential is to pull from Apple’s fruit basket and provide an experience so compelling that people will be drawn into the WebOS ecosystem. After all, this is how Apple won hearts and minds with the iPod. People actually purchased Macs based on their iPod experience. So how can HP use the TouchPad as a gateway drug into the WebOS ecosystem? Phil McKinney has been touting that the TouchPad will be transformative for the enterprise. Based on our data here at Argus Insights, they may have a chance. As people discuss their tablet usage, only the Playbook and the occasional Windows 7 Tablets evoke notions of “professional” use. 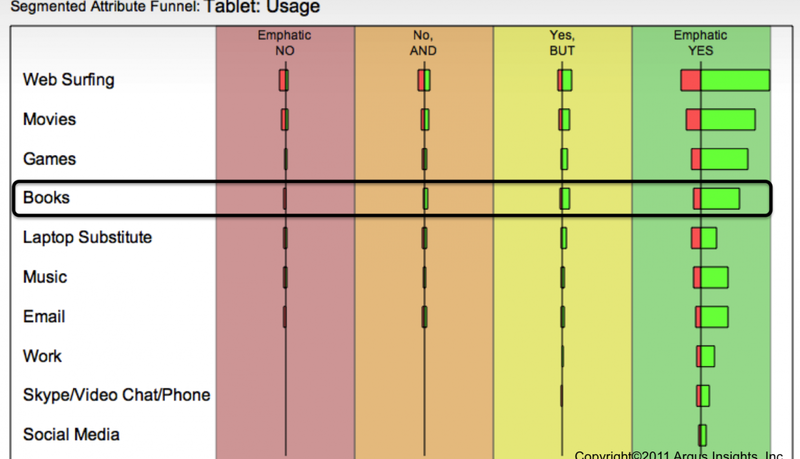 Notice below how the topic of “work” compares across usage modes for tablet users. case with games mentioned above professional usage. Tablets mimic our smartphones more than our laptops from that point of view. The need for an Angry Birds fix has extended to larger Tablet screens. As such the TouchPad has to enable users to work hard and play harder! iPad users continue to lambast Apple for the lack of Flash support on the iOS browser. (Trust me, we have the evidence. Just ask!) 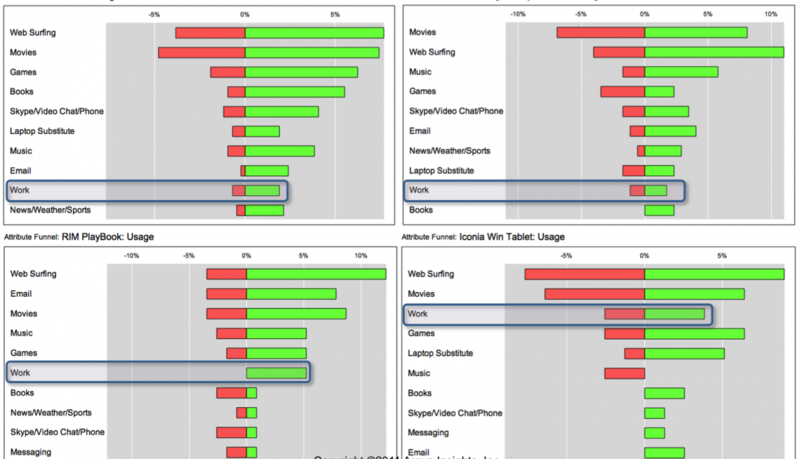 Given the larger screen of tablets, user expectations are shaped by their laptop usage more than their smartphone. 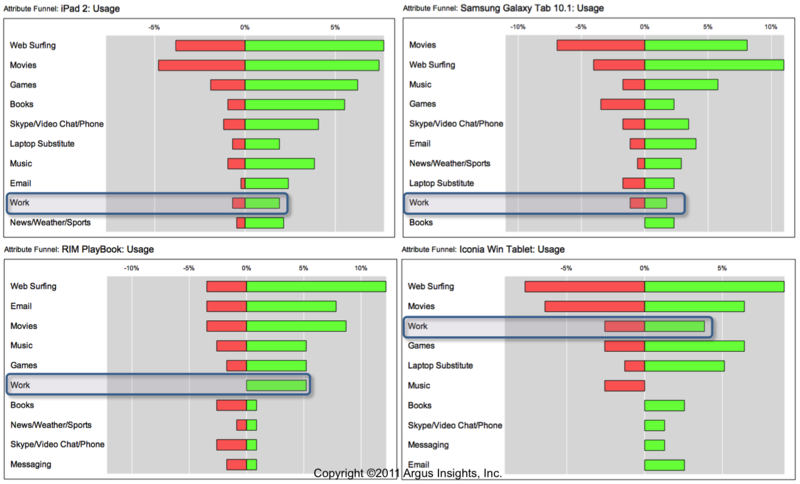 One of the key marketing features being touted by Android tablets is their Flash support. Tablet users expect that browsing the web on a tablet should look like, well, the web, not some gossamer threads of the web viewed through the peephole of the smartphone screen. Unlike laptops and smartphones, tablets are increasingly becoming group computing devices. “Hey dear, toss me the iPad. I want to look something up real fast.” “Mom, can Candice and I play Angry Birds on your Iconia?” HP has the opportunity to add personas to the TouchPad so that the device tailors its experience to the user who happens to hold it. This could be a huge source of delight for families if they also improve the stickiness of the WebOS experience as HP seeks to win over consumers. *At Argus Insights we view Woot.com and other deal-a-day sites to indicate whether or not a particular device has “Jumped the shark.” Argus Insights does not endorse any third-party products or services. eReaders are getting a ton of press lately, and for good reason. Turns out people still like to read literature longer than 140 characters. While Kindle has made many people leave their dead trees at home, tablets have turned out to be a hidden favorite for eBook publishers and fans alike. In today’s post, we’ll take a shallow dive into how tablets are being used for book consumption. My personal experience with eBooks started with Stanza on my iPhone. My wife became so concerned with her bleary-eyed husband that I received a Kindle over the holidays. It’s my constant companion on trips and even when dropping the kids off at school. The display is fantastic and easy on the eyes. Though I shudder when I do it, I still read content on my other devices, smartphone, and laptop included. Tablets offer similar levels of multi-tasking accessibility and are widely regarded as the “swiss army knife” of personal computing. They can do a lot of useful things when you need it even though specialized tools would serve you better. Given the broad utility, many people keep their tablet with them always and, in contrast to your swiss army knife, you can take it on the airplane with you. Question is, for tablets, is the eBook experience the corkscrew (seldom used, but much talked about) or the scissors (not the reason you bought it, but the most-used feature) of the overall tablet experience? 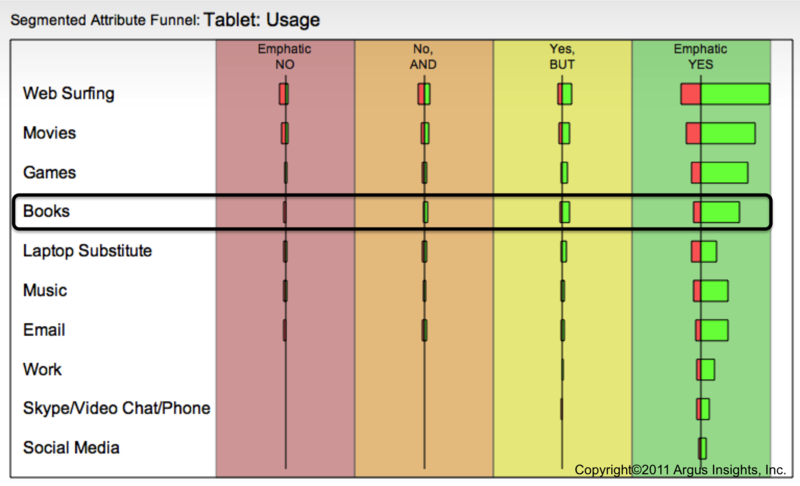 you’ll find our Segmented Attribute Funnel™ for the various tablet usage scenarios. eBooks rank as the 4th most popular usage based on how customers share what’s important to their tablet experience. This puts eBooks out of corkscrew territory and squarely into the scissors category. If you look across the sentiment segments you find that even people that don’t care for their tablet (the No, AND segment) find that eBooks are still something to crow about. It’s interesting for the tablet market that users would rather curl up with a piece of aluminum and glass rather than listen to their favorite music. The tablet is the latest device in the battle for convergence in consumer electronics. As we can see from the data, like swiss army knives, these devices converge around different usage scenarios based on what customers are looking to do and the device capabilities. Dedicated eReaders may still have a place in this market but with a different flavor of convergence where eBooks are their “big blade” and web surfing becomes their corkscrew. Argus will start covering eReaders in the coming weeks to answer that question as we rely on user wisdom to decide which experiences deliver on the promises of delight.